Now that I’m living alone, I find the rate of consumption of bananas has slowed tremendously. 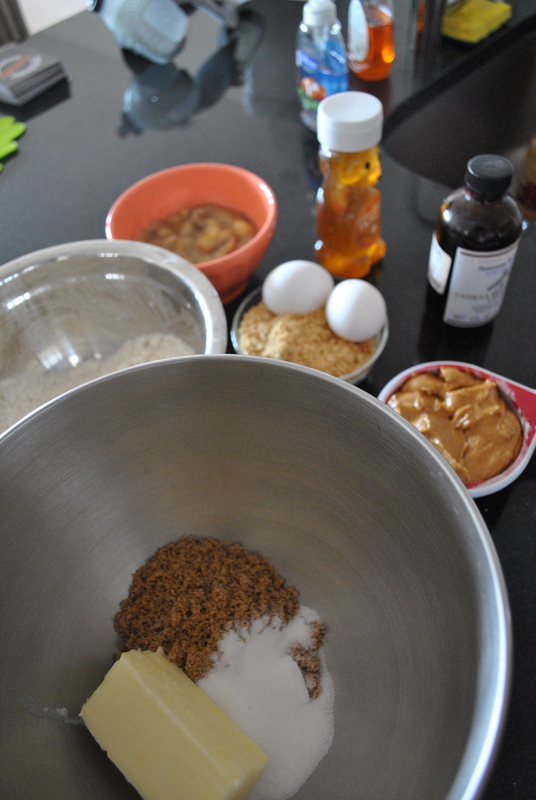 So, what does a baker do? I’ve been freezing the poor bananas that I don’t get around to eating and have gone into overripe mode. With a freezer shelf filling up with bananas, I had to do something. So I decided to see if I can make a cookie version of one of my favorite post run recovery sandwiches, the Peanut butter banana sandwich with honey. The tricky part about adding bananas into a recipe is how to deal with the additional moisture content it contributes. Where do I cut back, where should I add more? In the past, I’ve found myself with some rather soggy cookies, and have stopped using them in cookies, and just using them in quick breads. Today I tried again. 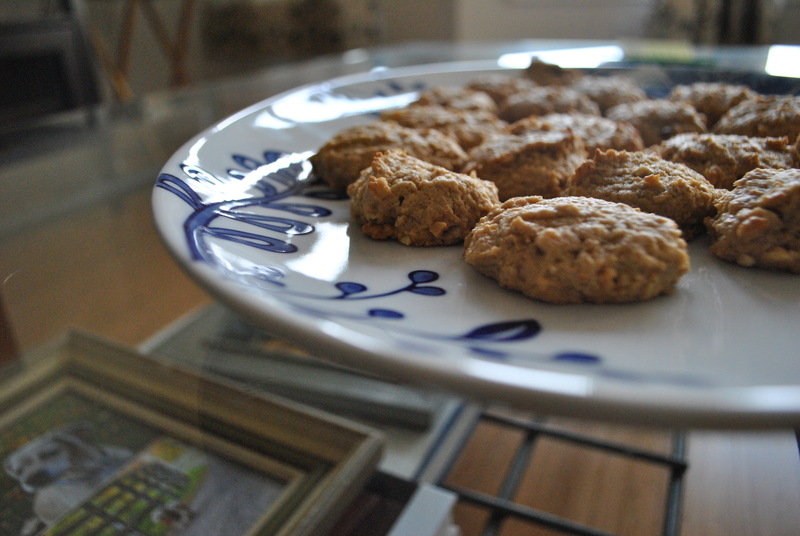 I based my cookies on the Peanut Butter Cookies out of my handy dandy America’s Test Kitchen Family Baking Book. Substituted two cups of sugars with a generous half cup (unpacked) of Brown sugar and skimpy half cup of granulated sugar. Substituted 2 sticks of butter with one stick of butter at room temp (more or less). Then I went through the motions, and the first thing I noticed was that the batter was much mushier than it would be if I followed the recipe. Therefore cross hatching was not necessary. When all said and done, the cookie that resulted was nice and soft in texture. 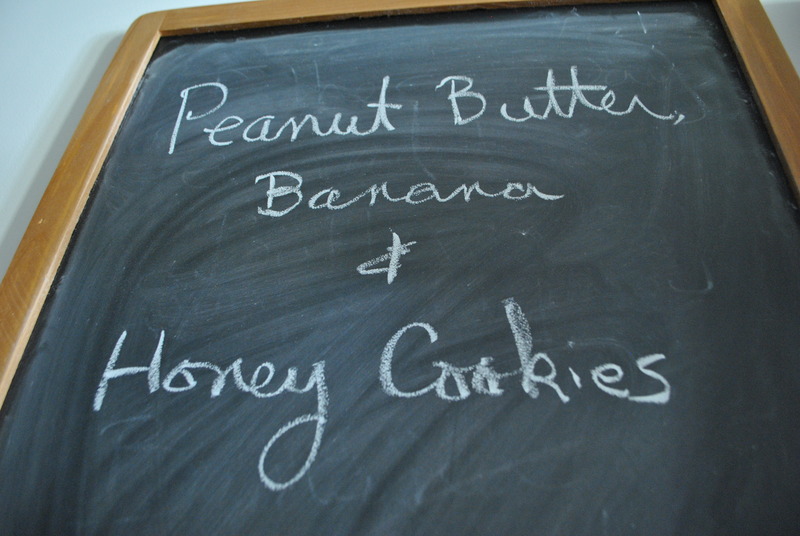 There is a wonderful peanut butter flavor and the banana is present, but not overwhleming. It does kind of taste like I was eating the sandwich, although the honey is absent. Perhaps next time a little more might be necessary. The usual yield is a lot. I estimate I got about 65 my size cookies. Time find some people to take these off my hands before I eat them all! Yum…I think I’m STILL waiting for my cookies. You should consider narrowing your engineering practice to engineering tastey treats. I believe your real passion is evident.